These Eggless Soft Molasses Cookies are the slightly crisp around the edges with a super soft, melt in your mouth, center! 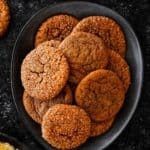 Packed with the amazing, rich flavors of molasses, ginger, and cinnamon, these molasses cookies are easy to make with simple ingredients. Make ahead and freezing tips included. Whisk the flour, baking soda, cinnamon, ginger, cloves, nutmeg, and salt together in a medium mixing bowl until well combined. Set aside. Mix together in a small bowl the ingredients of the fake egg. Set aside. Beat the butter and brown sugar together with an electric mixer on high speed until creamy, about 3 minutes. Add the molasses and beat until combined. Then add the fake egg mixture and vanilla extract and beat until combined, about 1 minute. Reduce the mixer’s speed to low, add the dry ingredient, scrape down the sides and bottom of the bowl as needed, and continue beating until well combined. Cover the dough tightly with plastic wrap and chill for 1 hour and up to 3 days. When ready to bake, preheat oven to 350° F (180° C). Line two large baking sheets with parchment paper or silicone baking mats. Set aside. Roll cookie dough, 1 tablespoon each, into balls. Roll each in raw sugar, if desired, and arrange 3 inches apart on the baking sheets. Bake for 11-12 minutes or until edges are set and tops are cracking. Remove from the oven. Allow cookies to cool on the baking sheet for 5 minutes and then transfer them to a wire rack to cool completely. Store: Place cookies in a covered container. They will stay fresh covered at room temperature for 1 week. Make Ahead: You can prepare this cookie dough up to 3 days in advance. Keep the dough wrapped in plastic in the refrigerator until ready to bake. To bake, remove cookie dough from the refrigerator. If the cookie dough has been chilled longer than 2 hours, let it sit at room temperature for about 10 minutes before rolling. Freeze: Unbaked cookie dough balls will freeze well for up to 3 months. To bake, let the frozen balls sit at room temperature for 30 minutes and then roll in sugar. Bake as instructed.